It's been five years since New Horizons roared into the Florida skies – speeding from Earth faster than any spacecraft before it – and began its journey to the unexplored regions of the planetary frontier. Today, with New Horizons more than halfway through its voyage to Pluto, mission team members look back on the historic launch and a few of the events since. "Five years in flight already! It's a credit to our spacecraft and operations teams that we've traveled so far without any big problems cropping up," says New Horizons Principal Investigator Alan Stern, of the Southwest Research Institute. "We still have four years to go until encounter operations begin, but we're already excited to see the light at the end of the tunnel that comes in 2015. Go New Horizons!" Ready to fly: New Horizons is prepared for liftoff from Launch Complex 41. At noon EST on Jan. 17, 2006, New Horizons sat atop an Atlas V rocket at Launch Complex 41, Cape Canaveral Air Force Station, Florida. Just above it, though, were layers of clouds that blocked the rocket’s path to the skies. "We continued to hope that the clouds would break long enough to allow us a chance to launch, but no luck," says Mission Operations Manager Alice Bowman, who was monitoring the spacecraft with her team in the mission operations center at the Johns Hopkins University Applied Physics Laboratory. 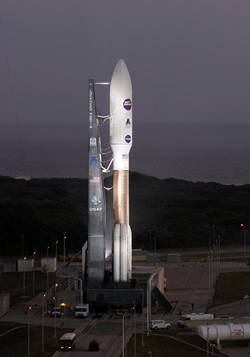 The call to scrub the launch came at the end of a two-hour window. Jan. 18: new day, same tough luck. Thanks to a power outage at APL in Maryland, the mission operations center was running on backup generators and large cooling hoses were routed through rooms to keep computers (and operators) running at safe levels. A consequence of this otherwise effective workaround was that spacecraft engineers supporting the launch would have to share just a few workstations; they would also have to share telemetry displays, which limited the amount of information available at any one time. "We were concerned that the limited availability of telemetry could interfere with any contingency response we would have to make in case of an anomaly after we separated from the launch vehicle," recalls APL's Dave Kusnierkiewicz, then the New Horizons mission systems engineer, who was manning a console near the launch site at Kennedy Space Center. "So, we decided to wait another day."